NAPA VALLEY, CA, AUGUST 9, 2016 – The V Foundation for Cancer Research’s annual fundraiser, the V Wine Celebration, garnered more than $5 million over the weekend of August 4-7 for cancer research. With a $500,000 matching grant from the Prostate Cancer Foundation, the total included more than $2 million in “fund-a-need” donations to support prostate cancer research. The gala kicked off with a tribute video celebrating the powerful and passionate acceptance speech by Valvano that has inspired millions. Robin Roberts, LeBron James, Dwayne Wade, Candace Parker and others spoke Valvano’s words in support of critical cancer research. “We need your help. I need your help. We need money for research. It may not save my life. It may save my children’s lives. It may save someone you love.” Sadly, The V Foundation Wine Celebration lost two friends this year, Napa Valley’s Neil Aldoroty and Lowell Herrero, and Allegro honored them and toasted their wives, Karen Aldoroty and Janet Herrero, who were in the audience. Special guest speaker, football legend and sportscaster Joe Theismann spoke about his friend, Jim Valvano, and why he supports The V Foundation. He also told funny stories including one about changing the pronunciation of his name in 1970 to give himself a better chance of winning the Heisman Trophy (it didn’t work). And then he got serious. He thanked the doctors, “the real heroes who sacrifice so many years of their lives…they never stop,” adding “It’s nasty, but it is defeatable and I believe in our lifetime we will see a cure for cancer. Not a treatment for cancer, but a cure for cancer.” Theismann was with Valvano at the 1993 ESPY Awards, when Valvano announced the creation of The V Foundation for Cancer Research. To this day, Theismann carries a copy of Valvano’s speech in his briefcase. The most compelling component of the auction was the fund-a-need, with guests raising their paddles to pledge donations to support research into prostate cancer. V Foundation CEO Susan Braun announced a collaboration with the Prostate Cancer Foundation, whose president and CEO, Dr. Jonathan Simons, internationally recognized physician-scientist, oncologist and acclaimed investigator in translational prostate cancer research, kicked off the fund-a-need with a $500,000 matching grant. Gary Newell, retired businessman and long-time supporter of The V Foundation, was at the gala with his wife Heather. A video was shown of the Newells, right after Gary was diagnosed with prostate cancer having previously survived skin cancer, visiting V Scholar Karen Sfanos at her lab at the Johns Hopkins University School of Medicine, where she is studying the cellular and molecular pathology of prostate disease. Today, Newell is cancer-free. V Foundation CEO Susan Braun also announced a $400,000 grant from T.K. and Ginger Wetherell, who were not able to attend the event. T.K., who has prostate cancer, wanted to find a way to support the work of The V Foundation, and he and his wife hosted a fundraiser at their home in Florida where they raised $400,000. Their donation has been dedicated to a research targeting cancer, including prostate, with genetically engineered poliovirus at Duke University Medical Center. Another fundraising highlight was the 32-lot live auction. Auctioneer John Curley with assistance from Tony Award-winning Christian Hoff, kept the bidding lively, with guests purchasing experiences that included a vintner dinner with Lesley Visser and Beth Nickel, an incredible fashion show at Jean-Charles Boisset and Gina Gallo’s home with designer Rubin Singer, a Grace Family Vineyards dinner and a separate event with the Dalai Lama, the U.S.Open, the ESPYS, the Super Bowl and more. Shari and Garen Staglin took to the stage to talk about auction lot #25, a private dinner at their home, and Garen ended up served as auctioneer for the lot generating $200,000 when he offered to double the lot. The evening ended with a private performance by Grammy Award-winning Eagles guitarist Don Felder. One of the many highlights of the weekend was the vision of women – and men – donning pearl necklaces to show off their support of The V Foundation. More than 250 raffle tickets were sold at $500 each, raising over $125,000 for The V Foundation. Each raffle ticket purchase included a pearl necklace, and Carole Marks, who had the winning ticket in the “Pearls of Hope” raffle, also took home an 18K white gold diamond bracelet valued at $75,000, courtesy of Stephen Silver Fine Jewelry. Stephen Silver, who lost his own father to cancer when he was just 13 years old, pledged a $500,000 commitment over the next five years to The V Foundation. A translational grant will be awarded to Dr. Julie Bauman, associate professor of medicine at the University of Pittsburgh in honor of Silver’s father, Jokey, who died from esophageal cancer. The gala dinner and live auction at Nickel & Nickel winery concluded the weekend’s activities, which kicked off Thursday, August 4, with a Hall of Fame luncheon at Far Niente Winery, hosted by Beth Nickel, Dirk Hampson and Larry Maguire, followed by several intimate winery dinners. Jim Borsack and Duffy Keys hosted diners at B Cellars, while John Conover hosted diners at Odette Estate. Garen and Shari Staglin welcomed another group at Staglin Family Vineyard and Wesley and Jessica Steffens hosted diners at Vineyard 7 &8. Also on Thursday, Mary Novak and Beth Novak Milliken hosted members of The V Foundation Giving Club at the Humanitarian and Founders Dinner at Spottswoode Estate. Guests at all the dinners were then invited to gather at Villagio Inn & Spa for the Corona after-hours lounge. Friday evening’s popular “Rock The V” party at The Pavilion at The Vintage Estates in Yountville featured offerings from Napa Valley’s renowned restaurateurs and preeminent vintners, as well as a custom barrel auction where guests had the opportunity to bid on one-of-a-kind cases of custom-created wine blends from celebrated winemakers. The evening ended with guests dancing to Project M.
Saturday morning, the Foundation presented Answer for Cancer, a free, public cancer research symposium, where prominent physicians and research scientists from around the nation gathered to present the most current advances and discoveries in clinical applications, new diagnostics and alternative treatments for cancer. Speakers included V Scholar recipient Dr. Felix Yi-Chung Feng, associate professor of radiation oncology, UCSF School of Medicine, who provided an update on his V F-funded research. The goal of Dr. Feng’s research program is to individualize treatment for patients with aggressive prostate cancer and breast cancer by identifying biomarkers that drive therapy resistance and developing treatment approaches based on these discoveries. Additionally, Dr. Levi Garraway, from the Harvard Medical School and Dana-Farber Cancer Institute, discussed the work his laboratory is pursuing on genomic and functional approaches to the characterization of human solid tumors, with an emphasis on melanoma and prostate cancer. He also discussed a unique form of convergence research being funded by The VF. Dr. Michael Kastan, executive director of the Duke Cancer Institute, discussed the work being done by the Consortium for Canine Comparative Oncology, a collaboration between the Duke Cancer Institute and North Carolina State University College of Veterinary Medicine. The standing room-only crowd of several hundred then had the rare opportunity to pose questions to these leading researchers during a lively Q&A session. Following the symposium, and new this year, was the All-Stars of Research Reception & Super Silent Auction at Groezinger Estate. The V Foundation’s signature fundraising event brought attendees from all over the country to the Napa Valley for a gala weekend of events and activities with a serious underlying purpose — to benefit the Foundation’s efforts to support significant cancer research at major institutions and research centers nationwide. Over the last 17 years, the event has raised more than $68 million, enabling the Foundation to provide 600 cancer research grants nationwide. Bay Area recipients have included the Martin O’Neil Cancer Center at St. Helena Hospital, Napa’s Queen of the Valley Medical Center, Stanford University School of Medicine and UCSF Comprehensive Cancer Center. For more information about the 2016 event, call 707-963-0611 or visit winecelebration.org. The 19th annual V Foundation Wine Celebration will be held August 3-6, 2017. The V Foundation for Cancer Research was founded in 1993 by ESPN and the late Jim Valvano, legendary North Carolina State basketball coach and ESPN commentator. Since 1993, the Foundation has funded more than $150 million in cancer research grants nationwide. One hundred percent of the net proceeds from events support all the work of The V Foundation. Due to generous donors, the Foundation has an endowment that covers administrative expenses. The Foundation awards peer-reviewed grants through a competitive awards process vetted by a Scientific Advisory Committee. For more information on The V Foundation or to make a donation, please visit jimmyv.org. 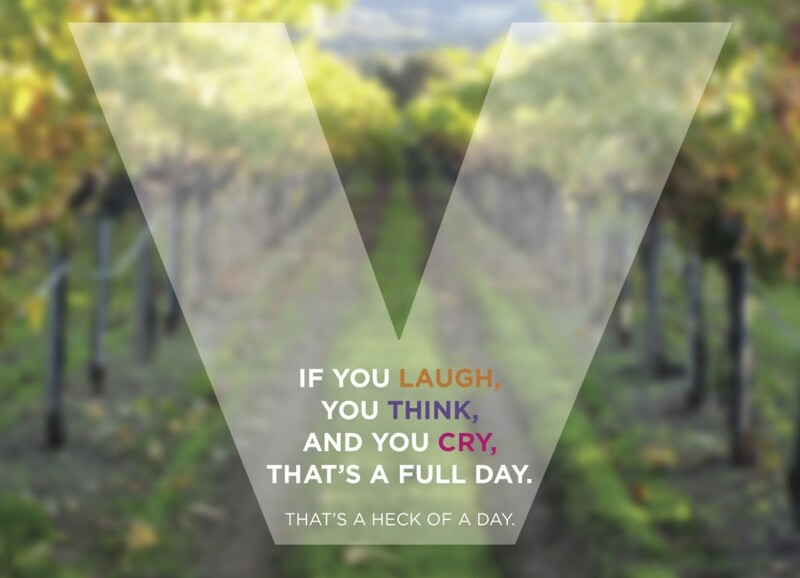 The V Foundation Wine Celebration is a world-class wine event and auction benefiting The V Foundation for Cancer Research. Set in Napa Valley, the heart of California Wine Country, this annual special event brings together 500 prominent members of the sports broadcasting, entertainment, media, lifestyle, technology, investment, medical and winemaking worlds to raise money to fund vital research in the fight against all types of cancer. The V Wine Celebration has helped fund 600 research programs at medical and research facilities across the country. Dedicated to giving back to the generous Napa Valley and surrounding communities that have so enthusiastically embraced it, the Foundation has included many Bay Area institutions among its grantees, including St. Helena Hospital, Queen of the Valley Medical Center in Napa, Stanford University and UC San Francisco. Founded by Julie Allegro, The V Foundation Wine Celebration has grown to be to one of the top-rated charitable auctions in the country. For more information on The V Foundation Wine Celebration, please visit winecelebration.org.